I remember growing up reading Amelia Bedelia books and am so excited I get to share her adventures with my daughter too. Of course she's changed a little over the years, but it's still fun to follow along with her adventures. 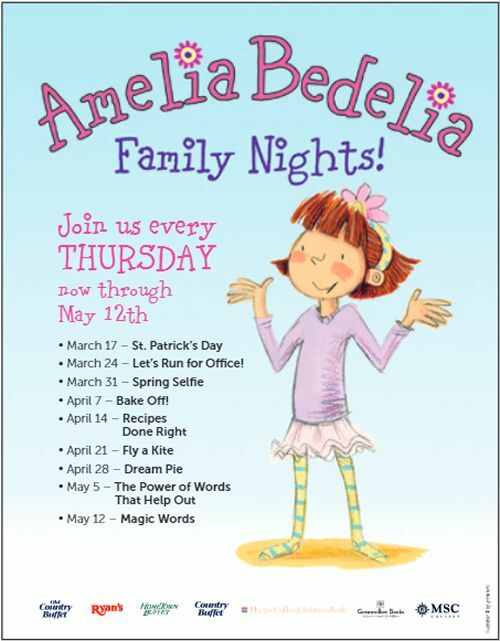 In honor of Amelia Bedelia Ovation Brands is hosting some fun themed family nights! From March 17th through May 12th, Ovation Brands is teaming up with everybody’s favorite children’s book character, Amelia Bedelia! Ovation Brands’ portfolio of restaurants includes Old Country Buffet, Ryan’s, Hometown Buffet, and Country Buffet. March 24 “Let’s Run for Office!” teaches kids the basics about election time and how to campaign by making slogans, buttons, and campaign promises before holding their own mini election. March 31 “Spring Selfie” is a great social media photo-booth-style experience the whole family can take part in. Frames, decorations, and mini props will be provided at each location. April 14 “Recipes Done Right” helps kids see how important it is to follow instructions – especially when baking – with a fun ‘scramble’ game to see which team can re-create certain recipes. 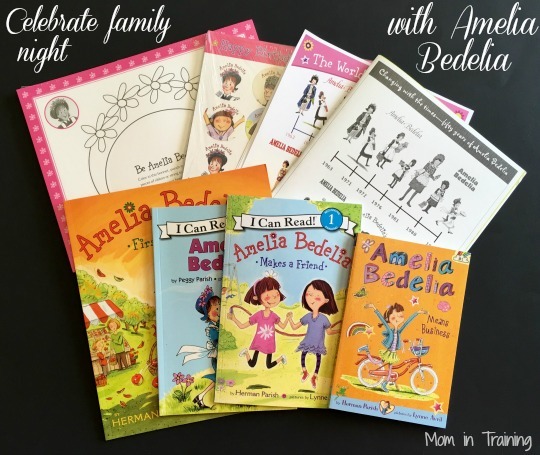 Win it: One lucky reader will win an Amelia Bedelia Prize Pack. Including: An Amelia Bedelia sticker pack, bonnet pack, poster, brochure, and 4 paperback books – Amelia Bedelia’s First Apple Pie, Amelia Bedelia Makes a Friend, Amelia Bedelia, Amelia Bedelia Means Business. This giveaway will end March 31st at 11:59 PM EST. The winner will have 24 hours to respond to my email. If no response, a new winner will be chosen. Prize fulfillment will be made by the sponsor, I am not responsible for prize delivery or lost or stolen deliveries. Open to residents of the US. I love the ice cream machine! I always enjoy the soup. I love the salad bar. I love the large selection of items. But, my absolute favorite thing at Old Country Buffet is the bread pudding. I have never been to an Ovation Brand Buffet. At their Ryan's chain I think they have a good salad bar. I like the dessert and the salad bar. I always go to the salad bar and load on the toppings! We enjoy the steak and the fried chicken. I like the ice cream. The cheesecake! I love their cheesecakes when they have them! I like the dessert bar. The fried chicken is awesome! I like the salad bar best. I love the salad bar and fried chicken. I have never been there before! I love the salad bar and the fried chicken. I like the salad bar. Nice variety. I have never visited an Ovation Brands buffet. I like the salad bar. I like the salad bar and the orange chicken when they have it. Or the polish sausage and sauerkraut. I've never been to one. I don't eat out a whole lot and when I do I tend to stick with what I know my family likes. I go for the fried shrimp if the have it but if not then the go any other main entrees. I've never been to one but would love to try! i love the dessert bar. i love sweets. I would love the steak! I'm a dessert bar kind of girl. My favorite is their fresh made macaroni and cheese. I have never been to that buffet before. Never been to one before but I love the dessert bar at any buffet! I always love the salad bar and I love being able to choose from all the items on it!